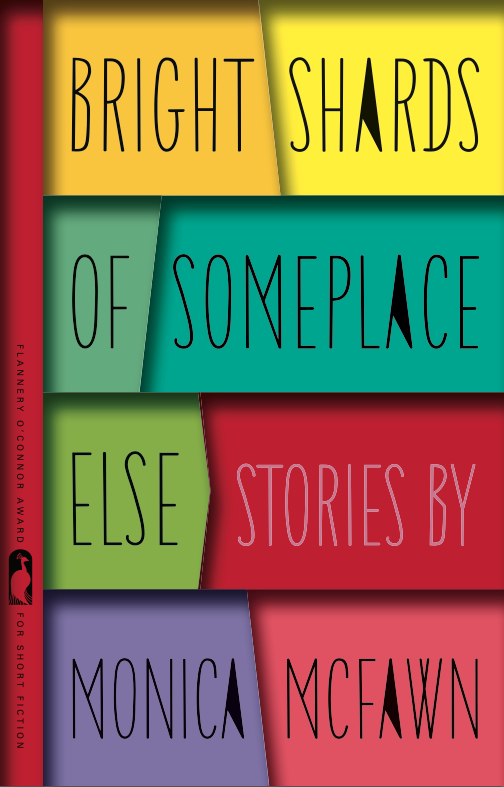 Win a signed first edition of Bright Shards of Someplace Else! Occasionally I come across a book that is more challenging than most to review. It’s not because it’s a bad book and I don’t want to write a scathing review; in those cases I just don’t bother with a review (life’s too short to be mean-spirited about a book). It’s because the work is so distinctive or pleasantly perplexing that I struggle to put my thoughts and feelings about it into words. Monica McFawn’s debut collection is such a book. She submitted a selection of her stories to the Flannery O’Connor Award for Short Fiction contest and was named one of the two winners for 2014 (the award is given out biennially to two writers). And there is good reason for that: although it is still early in her career, she is already writing at an impressively sophisticated level. The result is this collection (published along with Karin Lin-Greenberg’s supremely entertaining Faulty Predictions). McFawn, who teaches writing at Grand Valley State University in Michigan, possesses a fiercely idiosyncratic intelligence that is revealed on nearly every page of this eleven story collection. A few stories (“The Slide Turned on End,” “Elegantly, In the Least Number of Steps,” “Ornament and Crime”) reminded me of the quirky hyper-modern stories of Karen Russell and Ramona Ausubel (and, to a somewhat lesser extent, of George Saunders). In these cases, McFawn provides her eccentric characters with unique challenges that make for compelling reading even as they keep the reader confused or off-balance. Eventually, O’Hara persuades the journalist to provide him with a drop of blood so they can examine her own “abstract art” under the microscope. This experiment requires the use of a new blood stabilizing agent called Ethiphet. Soon the journalist is experiencing O’Hara’s theory firsthand and discovering new insights into art. But matters do not progress in the way one might expect. In McFawn’s more traditional stories, she uses her pen as a scalpel to cut to the heart of her characters’ foibles, and in doing so, she tells us much about ourselves. In the opening story, “Out of the Mouths of Babes,” Grace, a twenty-something oddball is baby-sitting a nine-year-old boy described by his mother as “different,” “special,” and “high-maintenance.” She is told that young Andy is not to use the phone. Grace soon learns that Andy is a highly capable negotiator; he likes calling salespeople to practice. After speaking with a termite exterminator, Grace asks him if he’d like to try clearing up a mistake on her phone bill with a call to customer service. What’s the harm? But one call leads to another as Andy straightens out Grace’s messy life. “Adult lives spread out before him like big sloppy maps that their owners could not refold.” But the evening doesn’t end quite so well. In “Dead Horse Productions,” the owner of a boarding stable passes away, leaving her son Bill to attend to matters. Despite his mother’s mid-life discovery of a passion for horses, Bill knows or cares little about horses. He is faced with a dead horse in the middle of winter and calls upon Fran, a former riding student who had become an acolyte and employee of his charismatic mother. They engage in a tense debate regarding how to move the frozen equine from the pasture. Fran wants to use a special massage she’d learned from Bill’s mother that would relax the muscles and allow the carcass to be moved more easily; Bill suggests using the backhoe. This encounter between two people incapable of understanding each other leads to a revelation for each of them. “Key Phrases” finds the manager of Journey’s End Memorials (“our company made videos of deceased loved ones to play at funerals or wakes”) attempting to find a way to fire an incompetent employee, with little success. In “Line of Questioning,” a college English professor is questioned by the police regarding the nature of his relationship with a former student who has been found murdered. Here McFawn plays with the conventions of such plots and again finds something new to reveal. “Snippet and the Rainbow Bridge” allows McFawn to demonstrate her impressive knowledge of the equestrian field. Judy and Marti own Heart’s Journey, a horse rescue ranch. Despite their successful business partnership, they have different philosophies of horse care. They retain two large animal veterinarians, Dr. Jim and Dr. Merrill, one Old School and one progressive, whose philosophies align with that of Judy and Marti, respectively. They are faced with the question of what to do about a seriously ill horse with a special talent for painting (yes, you read that right). The collection closes with one of the strongest stories, “The Chautauqua Sessions,” in which a successful country songwriting duo, lyricist Danny and singer-guitarist Levi, reunite at a studio in the Appalachians to try to recapture the magic of their heyday. But the chemistry is altered when Danny’s son, Dee, a recovering drug addict, arrives to reconcile with his father. Levi and the ranch-studio’s manager, Lucinda, give Dee the benefit of the doubt, but Danny has seen and heard it all in his long history of coping with Dee’s addiction. Is Dee really clean and sober? Can music bring them together? Will Danny risk making himself vulnerable to more suffering in yet another attempt to save Dee? Danny’s plan to get rid of Dee so he and Levi can work results in an unexpected but entirely plausible series of events that will change everyone’s lives. Monica McFawn’s stories are not easy reads with simple conflicts and pat resolutions. She leaves a lot to the reader to infer on the way to reaching a final impression of a story’s meaning. While some stories in Bright Shards of Someplace Else are less successful than others, McFawn is always intriguing and thought-provoking, and the quality of her prose is never an issue. This is a smart, ambitious collection of stories by a writer whose initial acclaim is certain to grow. Laline Paull on THE BEES: "I tried to put everything I know about how stories work into this book"